There are many ways to get involved in Document Freedom Day. 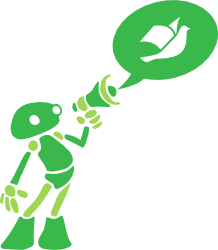 Help spreading the word, get your friends talking about Open Standards, join our community or even run a local activity. Read this page to get inspired on what you can do to let grow DFD bigger than ever. On Document Freedom Day: Invite your friends for a drink or a coffee break and tell them about the international day of Open Standards and why Open Standards are important to you - and for everyone. Or, if you already attend a regular meeting of any kind, use DFD with your mates to discuss about Open Standards around the date of Document Freedom Day. Or get active yourself - don't wait for the news to come. 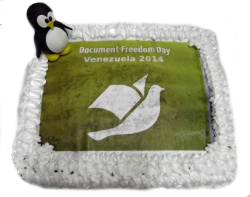 Let your friends know about Document Freedom Day. Talk with them from face to face or write them an email ... choose yourself the way that works best for you. 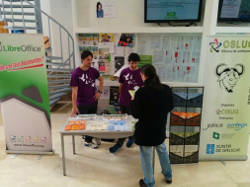 You can also download posters, leaflets and stickers'artworks and print the documents yourself. Put them on visible places in your company, university, school, library or others places. Show the public that there are people who care about Open Standards and why they do so. Or talk to people on the street or even set up a public booth. Just make sure to ask for permission in advance. Initially introduced as a gift for a DFD award, in recent years it became tradition for many local groups to celebrate DFD with a cake. This can be an invitation for the organisers, for an award winner or for everyone. Cakes are like Open Standards and you find them around the wold. Don't forget to make a picture of your cake and send it to us. We love them. Do you want your government, your University or any public body to use Open Standards? Then this is the day to go there and inform them about it. If it's a public institution like a University or a library, you might ask for permission to set up a booth for a day inside the building. If it is about a public administration, you might be more lucky if you ask for permission to set up a booth in front of the building. Don't forget to take pictures and let us know about. If there is an organisation, a public body or a company that you think of as a good example in the field of Open Standards, you can recognize their effort and support their activities by giving them an award. 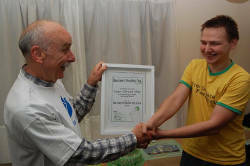 Many groups gave out a certificate and a cake in the past. Read more about How to award a Document Freedom Day Prize. Give a public presentation about Open Standards or try to initiate one by inviting speakers and well-known persons to talk about Open Standards. Local hackerspaces or Universities might be open to offer you a room for this. Do not forget to promote your event adequately, to get a lot of participants. We are running a DFD mailing-list where volunteers from all over the world come together to collaborate and share news, graphics, arts or other related stuff. Feel free to join! The same list is also used for coordinating translations of news items and other urgent and short-time requests from our side. Subscribe to the list and help us to grow DFD bigger than ever by spreading our message around the globe - even in your language! Besides, the list is also the place to be and feel as a part of the international team and cooperation. This is the primary medium to talk about DFD, your organisation of events and your experiences. Finally, we use the list from time to time to gather feedback from the community. DFD is a global campaign. To help us make it a worldwide success, please read how to contribute your own translations and website improvements. Whatever you do, whoever you are: Do not forget to register your event and get our global movement a public visibility.